Trigeminal neuralgia is a disorder of the trigeminal nerve (the fifth cranial nerve) that causes episodes of sharp, stabbing pain in the cheek, lips, gums, or chin on one side of the face. The trigeminal nerve, which is divided into three branches, is responsible for chewing, for producing saliva and tears, and for sending facial sensations to the brain. When this nerve breaks down for some reason, it can trigger brief but agonizing sizzles of pain on one side of the face. This condition is unusual in those under age 50 and more often occurs after 70. Women are three times more likely to have the condition than are men. When trigeminal neuralgia does occur in younger people, it is often associated with multiple sclerosis. The pain, while brief, is so severe that the sufferer often can't do anything else while the attack lasts. People with this pain often wince or twitch, which is where trigeminal neuralgia gets its French nickname tic douloureux, meaning "painful twitch." Trigeminal neuralgia is a disorder of the trigeminal nerve (which is divided into three branches, as illustrated above) that causes episodes of sharp, stabbing pain in the cheek, lips, gums, or chin on one side of the face. The origin of this disorder is not certain, but scientists believe it may be caused by degeneration, pressure, or irritation of the trigeminal nerve. pressure, or irritation of the trigeminal nerve. Some doctors believe the pain may be triggered by pressure from a nearby abnormally-formed artery lying too close to the nerve. Any part of the three branches of the trigeminal nerve may be affected. Neuralgia of the first branch leads to pain around the eyes and over the forehead; the second branch causes pain in the upper lip, nose and cheek; the third branch causes pain on the side of the tongue and lower lip. The first episodes are usually fairly mild and brief, and it may be minutes, hours, or weeks before the next attack. However, attacks tend to occur in clumps that may last for weeks at a time. As the sufferer ages, the episodes become more frequent and painful, until the person begins to live in constant fear of the next one. The momentary bursts of pain usually begin from the same spot on the face each time. The pain can be triggered by touching the area, washing, shaving, eating, drinking, or even talking. Even a cool breeze across the face can set off an attack. Pain is more severe at the ends of the affected nerve, especially over the lip, chin, nostrils, or teeth. Diagnosis is usually made by eliminating other problems that could cause similar pain in teeth, jaw, head, or sinuses. 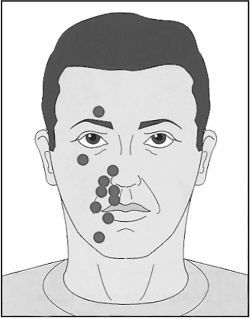 Because patients with the condition tend to avoid trigger points, avoiding chewing, shaving, touching or washing their faces can be a clue to diagnosis of trigeminal neuralgia. It is not easy to treat trigeminal neuralgia. Pain can be suppressed by a range of medicines, including the anti-epilepsy medicines carbamazepine (Tegretol) or phenytoin (Dilantin). These drugs slow down the nerve signals at certain nerve terminals, which eases the pain. However, these drugs cause a wide range of side effects, including nausea, dizziness, drowsiness, liver problems, and skin allergies. Some people develop resistance to the drugs or they can't tolerate the high dosage needed to control the discomfort. If the medicines are stopped, the pain usually returns. If drug treatment fails, surgical treatment to block pain signals from the nerve may be effective. Radio-frequency waves, gamma rays, or glycerol injections can deaden the nerve (and hence the pain). An operation that frees the nerve from whatever is compressing it (blood vessel or tumor) can permanently relieve pain, but this major neurosurgical procedure carries its own risks and complications. Alternatively, a new procedure seeks to place a cushioning sponge between the nerve and a pulsating artery wrapping around it to soothe the irritated nerve. Although the pain is momentarily incapacitating, it's not life-threatening. As the person ages, the attacks can be expected to occur more and more frequently. Chronic Pain Outreach. 822 Wycliff Ct., Manassas, VA 22110. (703) 368-7357. National Chronic Pain Outreach Association, Inc. P.O. Box 274, Millboro, VA 24460-9606. (540) 997-5004. National Institute of Neurological Disorders and Stroke. P.O. Box 5801, Bethesda, MD 20824. (800) 352-9424. http://www.ninds.nih.gov/index.htm. Trigeminal Neuralgia Association. P.O. Box 785, Barnegat Light, NJ 08006. (609) 361-1014. Multiple sclerosis — A progressive disease of the central nervous system in which the coverings of nerves in the brain and spinal cord are destroyed. pain in a nerve or along the course of one or more nerves, usually consisting of a sharp, spasmlike pain that may recur at intervals. It is caused by inflammation of or injury to a nerve or group of nerves. Inflammation of a nerve, or neuritis, may affect different parts of the body, depending upon the location of the nerve. Two common types of neuralgia are that of the trigeminal nerve (see tic douloureux) and that of the sciatic nerve (see sciatica). adj., adj neural´gic. neuralgia facia´lis ve´ra Ramsay Hunt syndrome. Fothergill's neuralgia tic douloureux (trigeminal neuralgia). geniculate neuralgia Ramsay Hunt syndrome. glossopharyngeal neuralgia that affecting the petrosal and jugular ganglion of the glossopharyngeal nerve, marked by severe paroxysmal pain originating on the side of the throat and extending to the ear. Hunt's neuralgia Ramsay Hunt syndrome. idiopathic neuralgia neuralgia of unknown etiology, not accompanied by any structural change. intercostal neuralgia neuralgia of the intercostal nerves, causing pain in the side. mammary neuralgia neuralgic pain in the breast. Morton's neuralgia tenderness or pain in the metatarsal area of the foot and in the third and fourth toes caused by pressure on a neuroma of the branch of the medial plantar nerve supplying these toes. The neuroma is produced by chronic compression of the nerve between the metatarsal heads. Called also Morton's foot or toe. The pain of Morton's neuralgia is frequently made worse with prolonged standing or walking. From Waldman, 2002.
nasociliary neuralgia pain in the eyes, brow, and root of the nose. postherpetic neuralgia persistent burning pain and tingling along the distribution of a cutaneous nerve following an attack of herpes zoster. trifacial neuralgia (trigeminal neuralgia) tic douloureux. severe, paroxysmal bursts of pain in one or more branches of the trigeminal nerve; often induced by touching trigger points in or about the mouth. 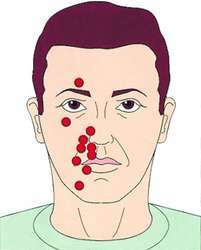 Paroxysmal shooting pains of the facial area around one or more branches of the trigeminal nerve, of unknown cause, but often precipitated by irritation of the affected area. Also called tic douloureux. a neurological condition of the trigeminal facial nerve, characterized by paroxysms of flashing, stablike pain radiating along the course of a branch of the nerve from the angle of the jaw. It is caused by degeneration of the nerve or by pressure on it. Any or all of the three branches of the nerve may be affected. Neuralgia of the first branch results in pain around the eyes and over the forehead; of the second branch, in pain in the upper lip, nose, and cheek; of the third branch, in pain on the side of the tongue and the lower lip. The momentary bursts of pain recur in clusters lasting many seconds. Paroxysmal episodes of the pains may last for hours. Also called prosopalgia, tic douloureux. Synonym(s): Fothergill disease (1) , Fothergill neuralgia, prosopalgia, prosoponeuralgia, tic douloureux, trifacial neuralgia. A disorder of the sensory nerve of the face, the trigeminal nerve, on one side in which sudden episodes of excruciating stabbing pain occur in the cheek, lips, gums, chin or tongue. These attacks last for only a few seconds or minutes and may be precipitated by a light touch to the face. The drug carbamazepine (Tegretol) is often effective. Fothergill sign - in rectus sheath hematoma, the hematoma produces a mass that does not cross the midline and remains palpable when the rectus muscle is tense. n a condition in which the trigeminal facial nerve is subject to paroxysms. Presents clusters of stabbing pain that may be transient but that usually remain for hours. Caused by pressure or damage to any of the three branches of the trigeminal facial nerve. Trigeminal neuralgia: distribution of trigger zones. Severe, paroxysmal pain in one or more branches of trigeminal nerve; often induced by touching trigger points in or about the mouth. Synonym(s): facial neuralgia, tic douloureux.